Each year any member has the opportunity to be proposed to serve on the committee. Members attending the AGM in October then vote for new committee members and to re-elect those who wish to remain on the committee. 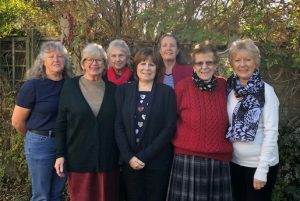 Following on from our AGM this October we now have 12 committee members who are shown in the two pictures below..
From left to right : Lynda Daly , Kate Dilks, Daphne Gazely, Margaret Alcock and Jeanne Doorne. From left to right : Dee Mackay- Pocock, Barbara Thorburn, Marjorie Mitchell, Jackie Vickerman , Julie Andrews, Sheila Daisy and Elisa Croucher. We all work together closely as a team to facilitate the smooth running of our WI. We have summarised our various roles below so that members see what we each do for Castle Green. I conduct the Monthly meeting and I oversee a Committee Meeting prior to the Monthly meeting to discuss the events taking place at the that Monthly Meeting. I also have the responsibility of making final decisions on matters arising both from the Committee Meeting and the Monthly meeting. These decisions are made in consultation with the Committee. If in doubt I consult the WI Adviser. Our roles are to support the President and run the monthly meeting and committee meetings in her absence. 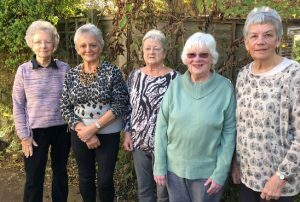 We represent Castle Green WI when our WI is invited to attend other WI events such as group, tea or lunch parties and fund raising activities. Margaret is also our press officer and as such she writes the monthly report that appears on our website and in the local parish magazine. My role as the Secretary is self explanatory, I write to other WI’s when we have events that we would like to share. I correspond with the EKF with all the monthly admin and various events. I write the minutes for both Committee & Monthly meetings. I receive and relay all the information cascaded down from WI National Office each month to the committee and members. My role is to manage the finance of our WI. I prepare the annual budget and make sure that at the end of year our account is balanced, approved by a W.I. examiner and presented to the members. I produce a financial statement at each meeting and ensure that all income is banked, receipts are filed, cheques issued, insurances, rents and subscriptions etc are paid. My role is to maintain a record of all our members and to enrol new members joining our WI. I update the WI’s MCS (membership communication system) so that you all receive your WI Life magazine regularly and those of you with email addresses are able to log into MyWI. I take a register at each of our Monthly meetings. I also run the website and make sure that it is up to date. My role, with input from other members, is to select the speakers for our Monthly meetings. I then contact each speaker to make a firm booking and produce the programme for the following year. I am the point of contact for the speaker and will either meet and greet them when they arrive to give their talk or arrange for that to be done. We are responsible for organising the refreshments (coffee, tea, cake & biscuits) at the standard monthly WI meetings, for supporting the Hostesses at those meetings and for helping to clear up afterwards. We also help run any other food events eg Soup lunches, Tea parties, the Birthday Breakfast and the Pot Luck lunch. We like our members to know that our thoughts are with them through both the happy and difficult times in their lives. So my role is to send out cards to members that are celebrating significant events in their personal lives such as important Birthday’s and Wedding anniversaries. I also send out condolence cards and cards to members who are ill.
Our roles include producing the rota of refreshment hostesses, the rota for the vote of thanks to the speaker and the rota for the flowers for the President’s table at the monthly meetings. We also are available to help in the kitchen with the refreshments, with distribution of the monthly magazines and wherever else we are needed at monthly meetings or our events. If you have any questions you would like to ask about any of the above roles or the committee’s work in general please speak to one of the present committee at a monthly meeting. Alternatively click on the link contact page to send us your question.